You are here: Home / Conservatory Craftsmen Blog / 2014 / Greenhouse or Conservatory: What’s the Difference? 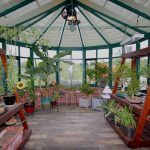 Greenhouse or Conservatory: What’s the Difference? 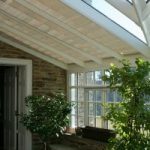 We are often asked about the differences between our conservatory designs. There are many words associated with a glass-enclosed room including conservatories, greenhouses, orangeries, sunrooms, and enclosed porches. While all of these terms are related, it is important for a homeowner to identify how they would like to utilize the space. 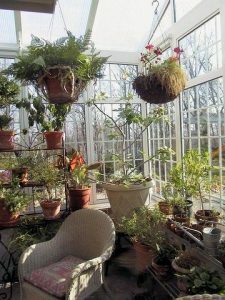 Typically, a conservatory is a glass-enclosed living space for people in which plants exist. A greenhouse is a more rugged structure, a place that plants can nurture and grow and people visit. Orangeries originated in the Victorian era when British aristocrats wanted to grow the mysterious fruits and vegetables that tradesmen brought with them from their countries. In the winter, the trees would be brought inside the warm enclosure while still having access to the natural sunlight. In the summers, the doors would be pulled open and the trees would be rolled outside, leaving a stunning entertainment space for the wealthy to enjoy. They are most similar to the modern hybrid, a greenhouse conservatory, which performs the functions of growing plants but most importantly looks beautiful and becomes a living space for playing, dining or relaxing. It also becomes an asset to the property that will add value to the home. Greenhouses are an ideal place to grow out-of-season fruits and vegetables in cold weather. Americans today are more health conscious and choose to live and eat more organic food. As horticulturalist, we praise the effort of sustainable, local food. Greenhouses are an emerging market as our clients are looking for a place to grow and enjoy plants, grow winter edibles, and start their own plants for spring and summer gardens. https://conservatorycraftsmen.com/wp-content/uploads/2014/06/Greenhouse3-225x300.jpg 300 225 Conservatory Craftsmen https://conservatorycraftsmen.com/wp-content/uploads/2017/11/conservatory-craftsmen-white-logo.png Conservatory Craftsmen2014-06-26 16:04:362018-02-26 14:51:20Greenhouse or Conservatory: What’s the Difference?